The Apostle Paul&'s letter to the Ephesians is one of the most dynamic portions of all of Scripture. A book which one commentator called &"the crown and climax of Pauline theology,&" Ephesians issues a clarion call to all who follow Jesus. In this newly updated volume, author and pastor Kent Hughes leads readers through the book&'s major themes, helpfully pairing skilled, exegetical insights with wise, practical guidance. From celebrating salvation by grace through faith to exploring the mystery of the new humanity God has created through Jesus, Ephesians&' dual focus on Christ and the church points the way to victorious Christian living in this sin-embattled world. Part of the Preaching the Word commentary series. 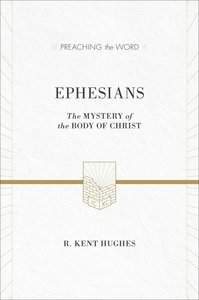 About "Ephesians - the Mystery of the Body of Christ (ESV Edition) (Preaching The Word Series)"